The judge cited the weapons' potential for "irreparable harm." Update (8/28/18 at 4:10 p.m. E.T. ): Gizmodo reports that files containing the plans for 3D printed guns are available for purchase on the Defense Distributed website despite the court order. To justify the post, Wilson cited the last page of the court document, which reads, “Regulation under the AECA means that the files cannot be uploaded to the internet, but they can be emailed, mailed, securely transmitted, or otherwise published within the United States.” By making the files available for purchase (anywhere other than 21 states, including the 19 whose Attorneys General have sued the federal government), Wilson is attempting to find a loophole in the ruling. We’ll see if it sticks. This decision is in response to a lawsuit brought by 19 attorneys general, who sought to block the release of the plans when they were slated to become available online in July. The original ban, set to expire on Tuesday, will now remain in place until the attorney generals’ lawsuit is resolved. That sets the stage for a national debate on free speech, censorship, firearm rights, and who (if anyone) should be allowed to print weapons. ONE IN THE CHAMBER. Five years ago, firearm rights advocate and self-styled “crypto-anarchist” Cody Wilson created plans for a 3D printable firearm and made them available on the internet. Legal disputes ensued almost immediately, which kept the plans offline, at least for a while. The controversy came to a head in July when changes to firearm export legislation meant that Wilson and his nonprofit organization, Defense Distributed, were cleared to put the plans online again. The plans were downloaded hundreds of thousands of times before Judge Lasnik issued the temporary block in July. 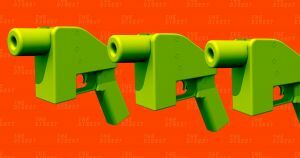 He, along with many in the justice department, became concerned that 3D printed guns are difficult to detect (they’re made of mostly plastic), and pretty much impossible for regulators to track (they lack identification numbers). That meant that people who were legally barred from buying a gun — such as felons, domestic abusers, drug addicts, and anyone who has been committed to a psychiatric institution — could simply print one at home. CODE AS FREE SPEECH. It’s not yet clear whether Wilson and his legal team will seek to appeal the decision, but he’s said in the past that he would fight to get the plans online at every turn. Wilson has argued that he should be able to put the plans online because they count as free speech, so the U.S. government shouldn’t be able to censor it. We may see if other courts agree with him.